Well-Engineered And Incredibly Strong, Brigade 800 Series Laterals From Hon Are Built For The Demands Of High-Activity Filing. 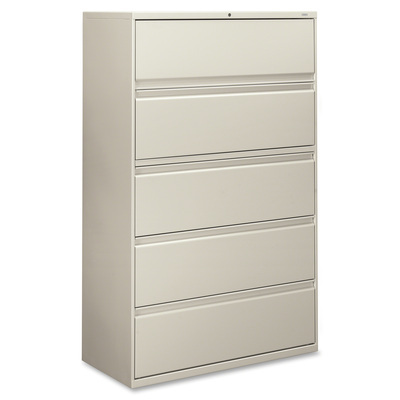 This Five-Drawer, 42"W Model Features A Sturdy Double-Walled Base To Resist Tampering And Strengthen The Case. It Accepts Letter Or Legal Hanging File Folders, Has A Posting Shelf And Has Full Radius Handles. Finish Color Is Light Gray..
Well-Engineered And Incredibly Strong, Brigade 800 Series Laterals From Hon Are Built For The Demands Of High-Activity Filing. This Five-Drawer, 42"W Model Features A Sturdy Double-Walled Base To Resist Tampering And Strengthen The Case. It Accepts Letter Or Legal Hanging File Folders, Has A Posting Shelf And Has Full Radius Handles. Finish Color Is Light Gray.